A robust rail network is key to economic growth. Decongestion of urban roads, safer movement of freight and faster & comfortable rail travel are engaging the attention of governments the world over as they realise the paramount importance of rail industry to sustain and aid in economic growth. 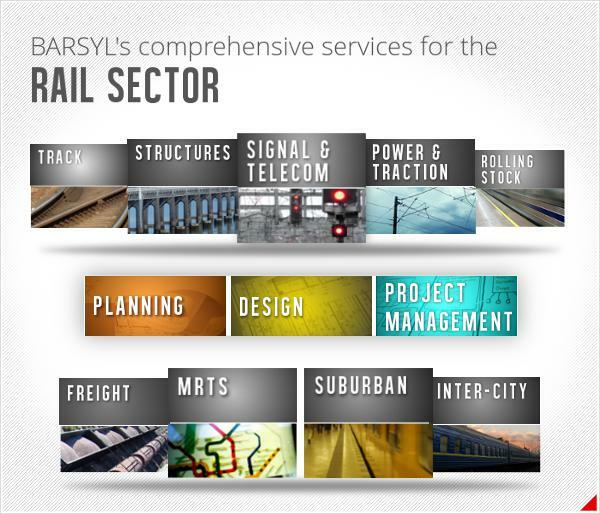 BARSYL's team consists professionals who are experts in rail industry. Drawing on their immense knowledge, skill and capability, we're very well equipped to provide comprehensive set of services in the rail industry. From feasibility studies to concept design, financial evaluation to planning & management through to operations & maintenance, we cover it all in our range of exceptional services. 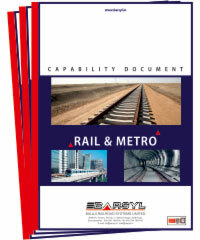 BARSYL's professionals have played a key role in the success of many prestigious rail projects both in India and abroad. We are a technology oriented company and use state-of-art tools combined with our commitment to deliver innovative and cost-effective solutions to our clients. Today, we are a leading rail systems consultants owing to our quality, high level of competence and strict adherence to values. With over 25 years' experience having worked on small to large projects, our experts are fully geared to deliver innovative, cost-effective and sophisticated solutions to get your rail project on track. One among TOP 100 SMEs in India. EPC World Award for Emerging Consultants in Urban Infrastructure Projects 2011. EPC World Award for Best Railway Consultant 2010.